Prof. Andrzej Udalski from the Astronomical Observatory of the University of Warsaw is a co-author of a scientific paper on the discovery of an exoplanet orbiting two stars. The event was detected by the Optical Gravitational Lensing Experimet sky survey. So far, the majority of exoplanets detected orbit single stars. 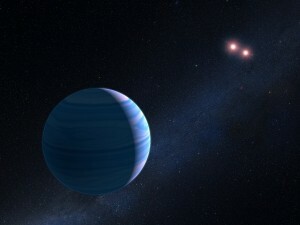 Only a few circumbinary planets – planets orbiting two stars – have been discovered to date. The planet, OGLE-2007-BLG-349, was detected during the Optical Gravitational Lensing Experiment led by prof. Andrzej Udalski from the University of Warsaw. OGLE searches for and observes effects from small distortions of spacetime, caused by stars and exoplanets, which were predicted by Einstein in his theory of General Relativity. These small distortions are known as microlensing. – OGLE has detected over 17 000 microlensing events, but this is the first time such an event has been caused by a circumbinary planetary system – explains prof. Andrzej Udalski from the University of Warsaw. OGLE cooperated with NASA/ESA Hubble Space Telescope. A number of models could have explained the observed light curve. The additional data from Hubble were essential to enable the scientists to pin down a circumbinary planet as the only possible explanation for both OGLE’s light curve and the Hubble observations. The discovery is pioneering and suggests some intriguing possibilities. While Kepler is more likely to detect planets with small orbits – and indeed all the circumbinary planets it discovered are very close to the lower limit of a stable orbit – microlensing allows planets to be found at distances far from their host stars. Recently, astronomers from the Astronomical Observatory of the University of Warsaw announced two discoveries: an extraordinary exploding star that confirms hibernation theory and an Earth-like planet orbiting Proxima Centauri. Both were published in the prestigious science journal “Nature”. Photo presents presumable system of OGLE-2007-BLG-349. Credit: NASA, ESA, and G. Bacon (STScI). The OGLE project exists since 1992 and is led by prof. dr. hab. Andrzej Udalski at Warsaw University Astronomical Observatory. The OGLE team had published over 580 scientific papers in prestigious professional journals, that were cited over 18 000 times by astronomers around the world. Data published by the OGLE project were used in over a thousand publications by astronomers around the world.